Alas, we have to split up: Your brand mistakes have sent this loyal customer -- me -- packing. Dear JetBlue: I miss you. We were great together, weren’t we? We liked and understood each other. I was the loyal customer, with “Mosaic” status, who flew twice per week and bragged about you to my friends. You were dependable and reliable with outstanding customer service, plush leather seats and plenty of legroom. I still remember when we first met. It was love at first flight. Sometimes, I find myself reminiscing when I'm flying on competing airlines; I still have your priority-baggage tag. I’ve been meaning to throw it out, but I just can’t bring myself to do it. Then, things got a little rocky. I said some things. You said some things. Your brand cheated on me, and now I’m seeing someone else. So, the time has come for me to, officially, bid the JetBlue brand adieu. A brand breakup with a loyal customer is the last thing you as an entrepreneur want to go through, whether you’re bootstrapping an early-stage startup or running a billion-dollar company. Building a quality brand is a major investment of both time and money. Yet all too often, businesses put in the work only to deviate from the game plan, alienating loyal customers and killing retention. “Branding is so important because loyalty comes from people doing business with companies they like and understand,” Juan Romero told me in an interview. He's president and CEO of (api)+, a retail design and branding firm that works with clients such as The Fresh Market, Publix and Sunglass Hut. “People want to use brands that have the same beliefs they do,” Romero said. My JetBlue experience didn’t have to end this way. Certain aspects of the brand were strategically sound. In other areas the brand stumbled -- badly. Here’s what entrepreneurs can learn from it. Never forget your brand promise. How JetBlue Won: Once upon a time, “Happy Jetting” was JetBlue’s official slogan, and it really rang true. At a time when airlines were beginning to experiment with baggage fees and were discussing mergers, raising ticket prices and generally making the flying experience miserable, JetBlue was different; passengers like me loved them for it. In 2008, the airline was ranked highest in North America for customer satisfaction. And revenue rolled in. I was one of the contributors. But that was fine because being a regular withJetBlue made me happy. It evoked an emotional response, so I returned again and again, spending as much as $5,000 per month on domestic flights with the airline. How JetBlue Lost: In 2010, JetBlue unveiled its “You Above All” campaign, forever changing the brand promise for customers. No longer content with just customer happiness, the airline took things a step further by telling customers they were the only thing that mattered. The problem? That wasn’t true. Why? Baggage fees were introduced. Also: Ticket prices went up. On-time departures declined. Customers were disatisfied. Revenue dropped, to the tune of 8.5 percent. The company had made a brand promise it simply couldn’t deliver on, especially because it had to answer to stockholders. I now fly JetBlue only when I have to, spending, on average, about $1,000 per year on domestic flights versus that earlier, monthly $5,000. Do the math. Hear and listen to your customers (they know your brand better than you do). How JetBlue Won: JetBlue’s customer support phone agents are the best. They are friendly, helpful and hard-working and seem to genuinely care. Your flight was delayed and you want to rebook? Done. Looking for a credit because the in-flight entertainment system was down? The funds are probably already in your TravelBank account. JetBlue hears its customers loud and clear, and that’s appreciated greatly . . . right up until it isn’t. How JetBlue Lost: Quick fixes are one thing, but the brand failed to recognize recurring patterns in a timely manner; in my case, make that until it was too late. 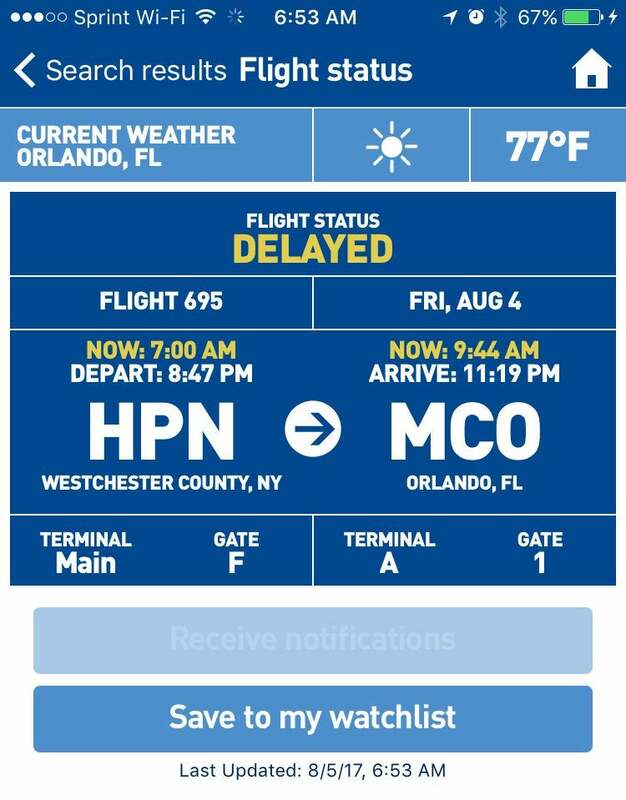 After what had to be my tenth of multiple delays -- a couple of which were 10 or more hours long (see the above flight status graphic) -- no quick fix was going to work. Missed business meetings and canceled vacations couldn’t be resolved with TrueBlue points. Broken entertainment systems made flights mundane. Worn seats and messy cabins left me feeling neglected. Inconsistent communications made me resentful. Don’t take just my word for it, though. Do some research. The writing was literally on the wall of review platforms and message boards years before the brand took any significant hit in revenue or image. How JetBlue Won: It didn’t. How JetBlue Lost: With branding (and marketing), there are two types of people: those who research, and those who rely on gut instinct. I suspect -- but cannot prove -- that JetBlue has more of the latter. The problem? The JetBlue brand is legroom. It is part of the fabric of the customer experience, a core brand-value prop. Legroom is still one of the most complained-about issues in aviation. Judges even recently ordered the FAA to review airplane seat sizes. Branding and brand marketing can be an arduous journey. It takes time, patience, dedication and even a little bit of luck. Some of the world’s largest companies haven’t mastered it. Making one of these brand mistakes can push your brand past the point of no return. Don’t let some of your most loyal customers be your next brand casualty. Don't be a JetBlue.